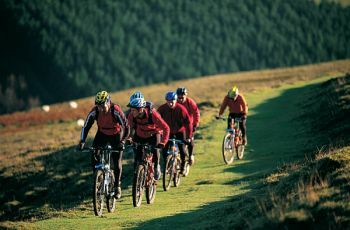 We offer mountain bike hire from our base in Hay on Wye on the edge of the Black Mountains, and can also deliver and collect bikes free of charge within a 20 mile radius. Our fleet of 30+ mountain bikes is maintained in tip-top condition, with bikes cleaned and serviced after every ride, to give you peace of mind when you are on the trail. And you can rely on our back-up service to help bring you and the bike safely off the hill if you do have a mechanical breakdown or injury. Delivery/collection of the MTB to/from your accommodation or agreed pick-up point. Puncture repair kit, spare inner tube, pump and lock. Custom route maps & directions. Emergency assistance, in case of mechanical breakdown. To reserve mountain bikes now, simply give us a call on 01497 822419 or email info@drovercycles.co.uk. A deposit of £10 per bike is required to secure the booking. Outdoor novice? Pushed for time? Unfamiliar with the area and want to ride the best trails? We can help! On our guided group MTB rides there's no need to worry about tracking down the start of a trail or messing about with a map and compass. Our guides are there to show you the way, and you'll also benefit from their local knowledge, ability to carry out trailside repairs and, if you're new to mountain biking, their advice on riding techniques. Look, we'll even carry your packed lunch for you, so what are you waiting for?! Brecon Beacons Mountain Bike Hire.